The GBU-39A/B FLM (Focused Lethality Munition) weapon is an ultra low collateral damage version of the Small Diameter Bomb (SDB) weapon system. It is a multi-purpose, insensitive munition, penetrating, blast/fragmentation warhead for stationary targets. FLM is guided by a GPS-enhanced inertial navigation system. The GPS unit is equipped with the latest SAASM/AJ (Selective Availability Anti-Spoofing Module / Anti-Jam) technology. 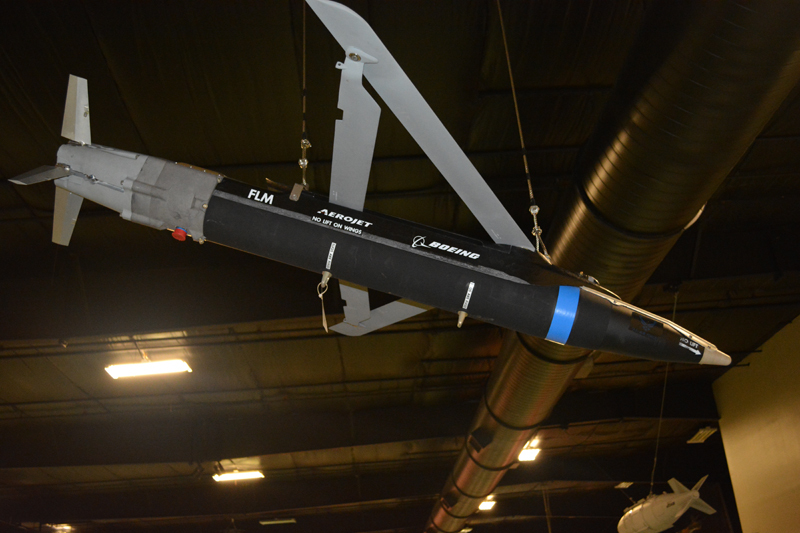 The FLM uses flip-out diamond wings to achieve a stand-off range of more than 60 nautical miles for high-altitude drops. Boeing also developed the new BRU-61/A bomb rack, which carries four GBU-39A/B bombs. The BRU-61/A is mandatory for FLM carriage, and can be employed externally (F-15, F-16) or in internal weapons bays (F-22, F-35, B-2). FLM program was initiated in April 2006, based on US Central Air Force’s identification of an urgent operational need for a low collateral damage weapon. In August 2006, the 918th Armament Systems Group at Eglin AFB, Fl and Boeing entered into a contract for the integration and test of the FLM warhead into the SDB Weapon System. The first 50 FLM weapons were delivered to the Air Force in March 2008. FLM uses a multiphase blast explosive fill developed by the Air Force Research Lab (AFRL) at Eglin AFB. The warhead is designed with a composite case to minimize case fragments. The weapon is designed to be carried on the BRU-61/A carriage. FLM will use all the existing SDB aircraft interfaces and can be used to complement the existing SDB Weapon system. This GBU-39A/B on display was structurally tested to determine maximum captive carry structural life; therefore, it is no longer serviceable and was donated to the Museum for display by the 681st Armament Systems Squadron at Eglin AFB, FL.